Is your mobility plan a genuine Sustainable Urban Mobility Plan? You can now find out using the free, online SUMP Self-Assessment Tool! The SUMP Self-Assessment Tool has been designed to enable ambitious and forward-thinking planning authorities to quickly assess the compliance of their plan with the European Commission’s SUMP guidelines. The self-assessment is based on a set of 100 clear and transparent yes-no questions that follow the steps in the well-known SUMP preparation cycle. By working through the questionnaire during plan preparation, or once a plan has been finalised, planning authorities can gain feedback on the strengths and weaknesses of their approach. 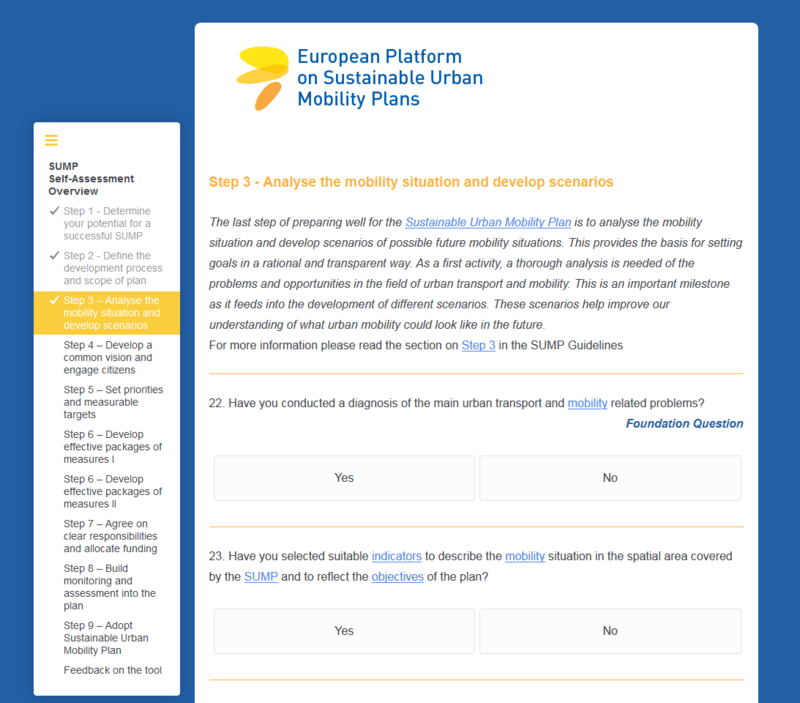 For those not yet familiar with the SUMP concept or terminology, the self-assessment questionnaire is also linked to a newly published online version of the SUMP Guidelines on Eltis, an informative SUMP glossary and a range of online learning resources on the Mobility Academy. For more information and to begin your own SUMP self-assessment, visit the Mobility Academy. Feedback on the Self-Assessment scheme is welcome to sump@rupprecht-consult.eu !